Aim: Endoscopic procedures represent an advance from conventional laparoscopic operations, with NOTES seeing clinical applications. However, in translumenal procedures, there can be difficulty with the closure of the luminal defect area, or even when closure is possible, there are issues with stenosis and deformation arising after closure. In cases where direct suturing of a defective area with the opening or resection of the stomach and large intestines is not possible, and if closure became easily possible using some kind of replacement materials, it is thought that applications of endoscopic surgery would increase. 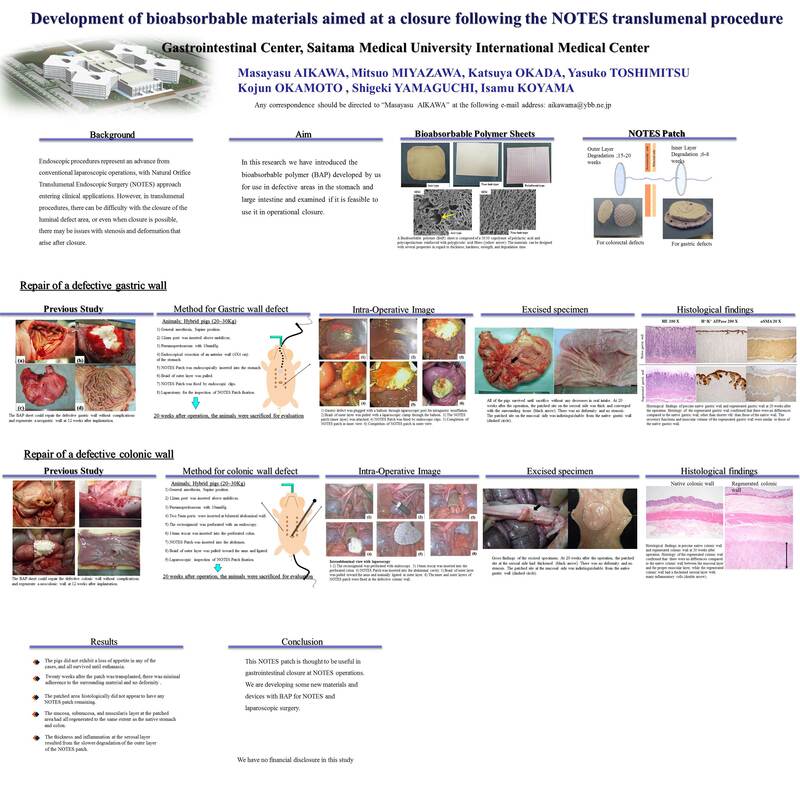 In this research we have introduced the bioabsorbable polymer (BAP) developed by us to defective areas in the stomach and small and large intestines, and examined the feasibility of its use for operational closure. Methods: (Examination of the stomach): the abdominal cavities of hybrid pigs were opened, and an 4×4 cm area of the anterior wall of the middle gastric body was excised, and a patch-like section of BAP where the same size was transplanted to close the defect. (Examination of the large intestine): A 2 cm defect in circumference was made in the sigmoid colon, and a BAP patch was transplanted endoscopically. The pigs were re-opened in all areas twenty weeks after the transplant, and the area was examined histologically and verified by cross examination. Results: In all cases the pigs did not exhibit a loss of appetite and survived until euthanization. Twenty weeks after the patch was transplanted, there was tiny adherence to the surrounding material, infection, deformity in the stomach or large intestine and a gross examination revealed a normal regeneration of mucosa. The area that had been transplanted with the patch histologiclally did not appear to have any polymer remaining and the mucosa, submucosa, and muscularis had all regenerated to the same extent as the native stomach and large intestine. Conclusion: This BAP patch is thought to be able to be useful in NOTES operation closures. We would like to demonstrate the results of this research to date in a NOTES operational closure using the BAP patch.